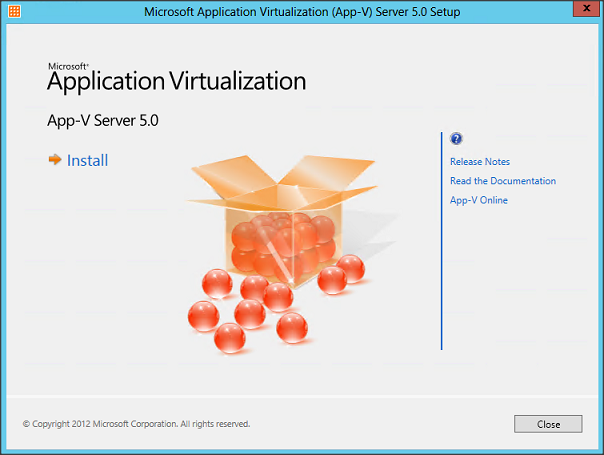 If you would like to read the next part in this article series please go to App-V Basics: Installing and Configuring the App-V 5 Infrastructure (Part 2). In a previous article series I described the installation of the App-V sequencer and the process of virtualizing an application within App-V (called sequencing). One of the frequently used methods is via the App-V infrastructure. 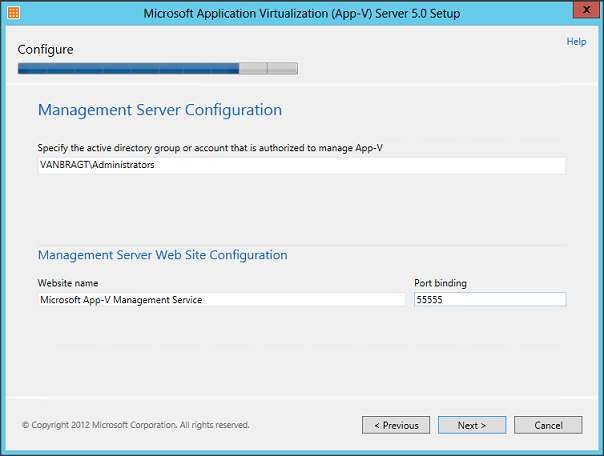 In this article I will describe the installation and configuration of a full App-V 5 infrastructure with all components available. The App-V 5 Backend Infrastructure consists of several components. These components are supported on Windows Server 2008R2 SP1 or Windows Server 2012. 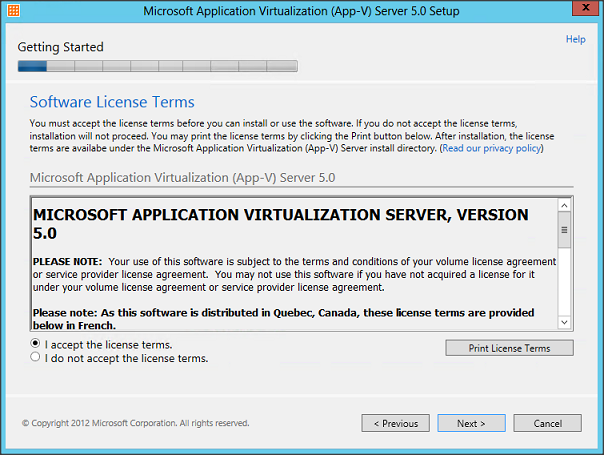 App-V is not supported on several systems like a Windows Server Core server, a domain controller and a server with SQL express edition installed on it. For this article I will use a Windows 2012 server. If you have a Windows Server 2012 available, some of the prerequisites are already part of the installed operating system, while Windows 2008 R2 does not have those available (by default). Windows 2008 R2 requires that .Net Framework 4.x, Windows PowerShell 3.0 and Update for Windows KB2533623 need to be available before the App-V installation is started. Both operating systems require some additional prerequisites depending on which components will be installed on the system. All components require that IIS is available with ASP.Net registration enabled. Also Visual C++ 2010 runtime is required, which is not added to the installation files. So you need to download it separately and install it before the actual installation. In this article Microsoft describes which Visual C++ 2010 runtime version you actually need. 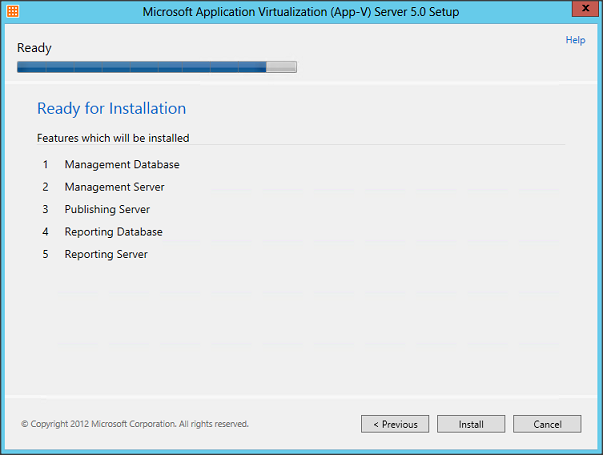 Last thing before actually starting the installation is to determine where you would like to store the App-V 5 databases. You can use a separate SQL database server or an SQL server on the same server as the App-V component. However, whichever option you choose, the database preparation should be executed on the local server where the SQL database exists. As this is done via the installation wizard, this can be difficult in situations where the SQL server is maintained by a different team or person. For this kind of scenario Microsoft releases a script/manual of the steps, which are by default done by the installation wizard. 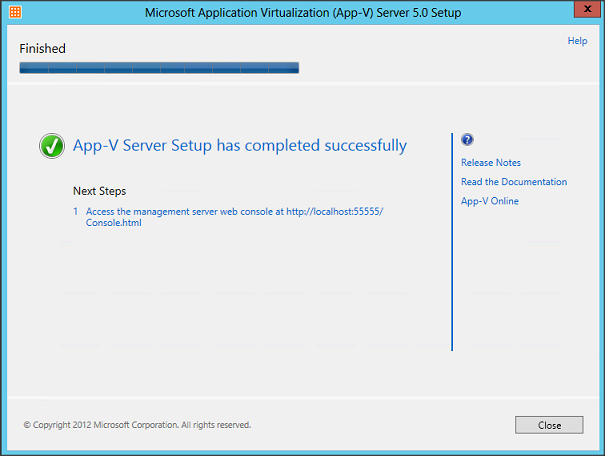 For this article I installed the SQL server on the same machine where the App-V backend components will be installed. We are finally ready to start the installation. The server component installation consists of 1 executable (APPV_SERVER_SETUP.EXE) complimented with some language packs. Starting the installation with this executable starts the installation wizard, select Install. Figure 1: App-V Initial Set-up screen. The second step is accepting the license agreement. Figure 2: Software License Terms. Microsoft has been delivering updates to the App-V components via WSUS for some time already. You can choose if you would like to update the App-V server components using WSUS by choosing Use Microsoft Update when I check for updates, if you would like to manage it via another way you need to choose I don’t want to use Microsoft Update. 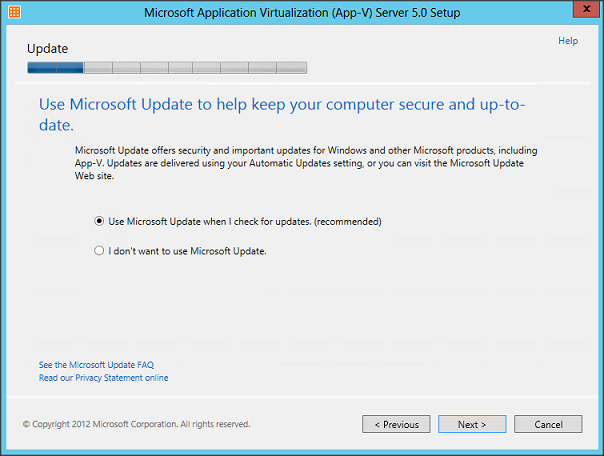 Figure 3: Update App-V via Microsoft WSUS. Next you need to define which App-V 5 backend component will be installed on the system. Depending on your infrastructure you can install all components on one server or over several servers. 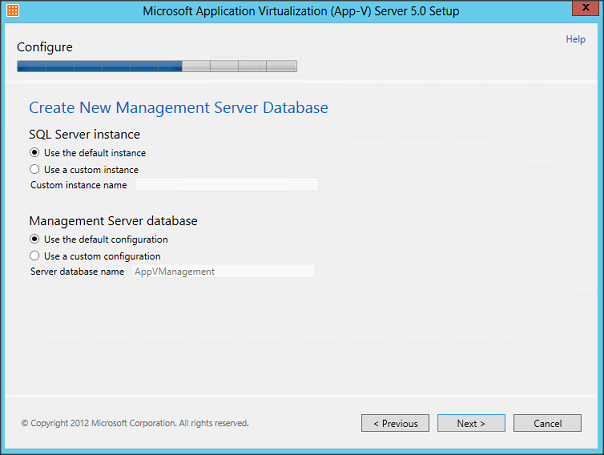 The two DB components should be run on the server where you have the SQL server installed on. For this article, as stated earlier, the SQL server will be run on the same machine. I will also install all components on the same machine. Figure 4: Selecting the App-V Server features tob e installed. If required you can change the destination location of the App-V 5 software, I will use the default path. Figure 5: Selecting Installation Location. The next step is to define the setting for the Management database. Firstly, you need to specify if you are using a specific (custom) instance or a default instance. 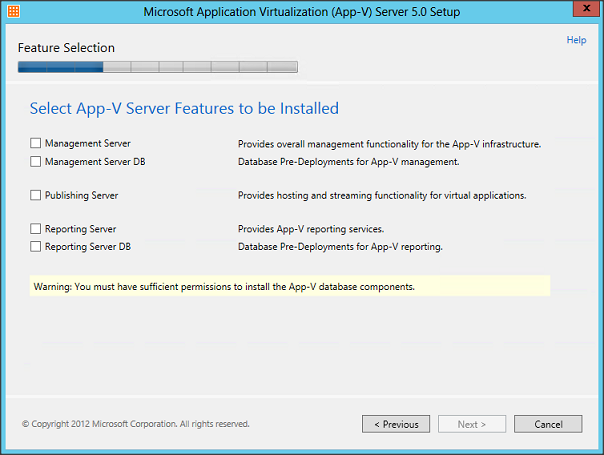 Secondly, you can define a specific name for the App-V management database or use the default one (AppVManagement). I have a default instance and will use the default database name. Figure 6: Configuring Management Server Database. If you separate the Management Server Database and the Management Server Machine you need to specify which server the Management Server Machine will be. If installed on the same machine the installation will select Use this local computer automatically. Figure 7: Define Management Server Machine Account. The same steps will be shown for configuring the Reporting database. These are similar as the Management Server Database, so you can specify which instance you would like to use and choose a name for the actual database. Figure 8: Create New Reporting Database. Again if you separate the database and the actual software component you need to specify the reporting server machine name (and optional a username to connect with it). As I’m installing all components on one server, there is no need or possibility to configure these settings. 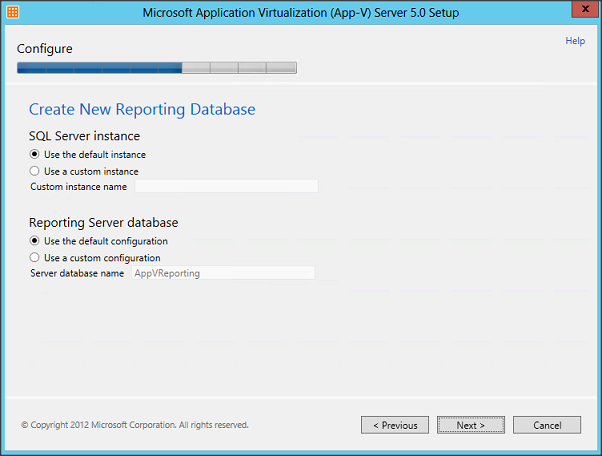 Figure 9: Create New Reporting Database Part 2. 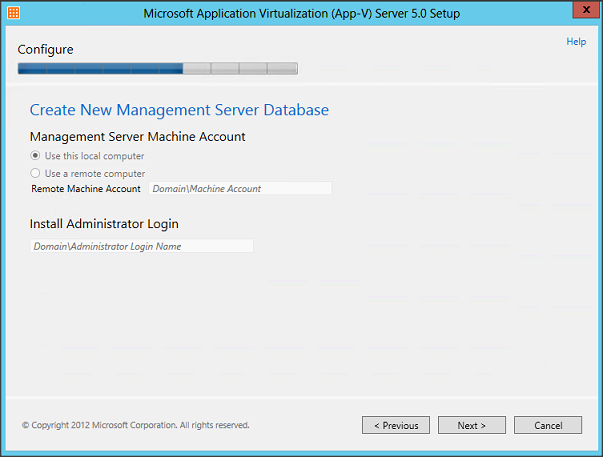 After the database part we need to provide the settings for the management server configuration. We need to specify the group or user which will be the App-V Administrators. Secondly, you can change the website name, but more importantly you need to specify a port number for the management server. There is no default option available, so you are free to choose whatever you like. Logically, you need to choose a port number that is not in use in your organization, I will use port 55555 in this article. Figure 10: Management Server Configuration. As I’m installing all components on the same machine all components will be listed during the installation, however, you will only see the components you selected. 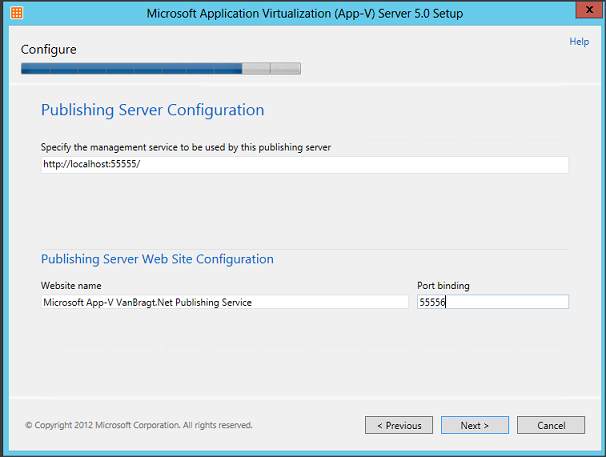 The second component which is the Publishing Server needs to be configured as well. First of all you need to provide the Management Service (if you install the components on the same machine, this one is filled in automatically). Secondly, you need to specify the Website name and port the component will be communicating on. Again, you are free to specify a value; I have chosen to use 555556. Figure 11: Publishing Server Configuration. 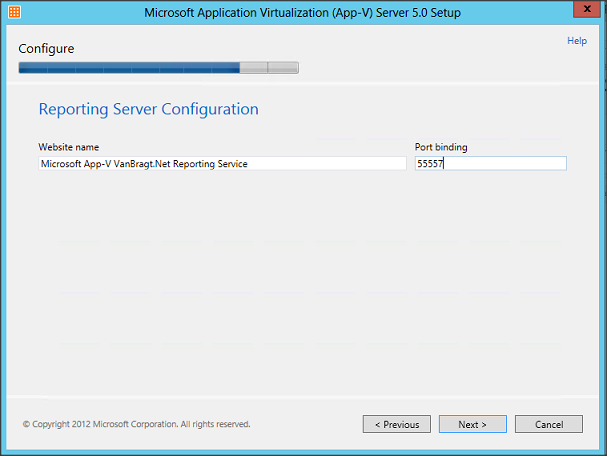 The Reporting Server requires a similar configuration. So, you can specify the Website name and port number for the service. Figure 12: Reporting Server Configuration. Next, the installation wizard is ready to execute the actual installation process, which will be started by pressing the Install button. Figure 13: Reporting Server Configuration. You are presented with the progress of the installation and at the end a message will be shown that the installation has completed successfully. What I really like is that the next step is also shown on the same window. Remember that URL because there is no shortcut created on the server. Figure 14: App-V Server Setup Finished. In the first part of this article series, I described the prerequisites and the installation steps for installing the App-V 5 Backend components. 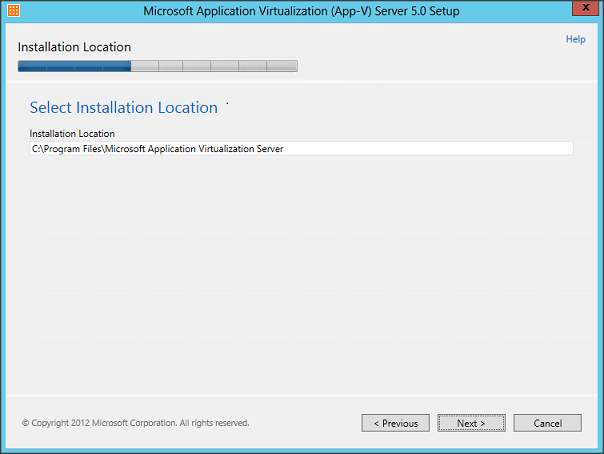 In the second article I will show the installation steps of the App-V Client and the configuration steps of both components so that a virtualized application can be started by the end-user.